Just Your Typical Saturday Night. 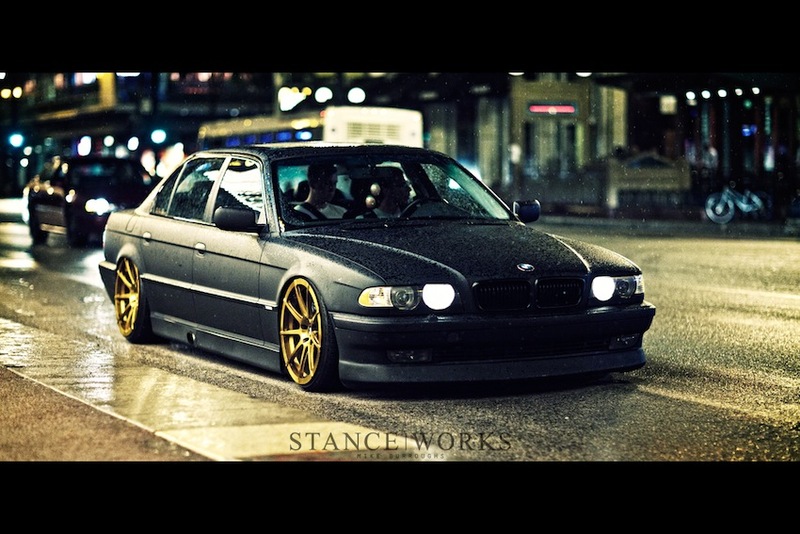 Burnouts in one of the busiest intersections in downtown Chicago in a 400whp flat-black E38 known as nothing other than Gold Wheels. That's how we spend our Saturday nights, screaming through cross-streets with open cutouts and barking velocity stacks. It's never easy to put Gold Wheels in to words, and its inarguably a love/hate car; but I have no question that everyone who sees the car in person, and more importantly, hears the car, falls in love instantly. Riding in the car, let alone driving it, is an experience in and of itself and represents the Fluid crew perfectly. It's a car that makes no sense, yet makes perfect sense. It's nearly a limousine but has the attitude of a race car, and the appearance of an automotive Rottweiler. It's simply Gold Wheels. Comments on Just Your Typical Saturday Night.